On my way to my life’s first academic conference where I will be presenting something of my own. 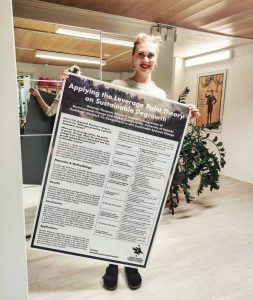 Last summer I sent an abstract of my Bachelor’s thesis to this Sustainability Science conference and to my surprise they invited me to come and give a poster-presentation on my thesis. The conference theme is Leverage Points for Sustainability Transformation. My Bachelor’s thesis is about about applying Donella Meadows system theory of Leverage Points on degrowth literature. The aim was to find out how societal change could happen according to Donella Meadows system theory and through what kinds of means the degrowth scholars were proposing that the change to a degrowth society could happen. I found out that degrowth scholars suggest a wide range of means to induce societal change but not all of them are very efficient. The essence of the Leverage Point theory is that there are a variety of ways to induce change but not all have the same power or “leverage”. For example, if the mindset (the paradigm) of the social system is that economic growth is the most essential way to ensure well-being, policies suggesting otherwise (for example putting environmental values as a priority) will have less power since the paradigm of the system is not in accordance. The paradigm of the system is one of the strongest leverage points and therefore weaker leverage points have less power and are subordinate to stronger leverage points. Changing the paradigm of the system is a strong leverage point to induce system change but at the same time it is also a very slow process to change the paradigm of a society. The leverage point theory of Donella Meadows is very interesting and easy to read. I recommend it to everyone that is interested in system theory and how to induce change through different means.